In 1843, St. Joseph Church in Mt. Holly, North Carolina was built. It was to be the first Catholic Church in Western North Carolina. On St. Patrick's Day, 1852, the cornerstone was laid for the city of Charlotte's first Catholic Church, St. Peter's. Work was completed on St. Peter's in 1893. St. Peter Church was under the care of the Benedictine monks from Belmont Abbey. A neighboring convent of the Sisters of Mercy, also in Belmont, had operated a school in Charlotte known originally as St. Mary's Seminary. The name was later changed to the O'Donoghue School, and in September 1930, the school was moved to the Dilworth neighborhood. It was not until the late 1930s that an additional church was needed to accommodate the growing Catholic population of the region. On March 17, 1938 construction began on Saint Patrick Church. Frank Frimmer, an Austrian native known for remodeling famous Old World churches, designed and supervised construction of the church, with its gray stucco face, 400-seat nave, balcony and 77-foot tall tower. The high altar of Carrara marble contained relics of St. Jucundius and St. Justina, and two side chapels were crafted as shrines honoring Mary and Joseph. John Henry Phelan who grew up in the Dilworth area, donated the funds to build the church in loving memory of his parents, Patrick and Margaret Adele Phelan. A Catholic grade school was built on the property in 1930. A rectory and convent were completed in 1941, and in 1943, the school was expanded to include a high school. The Cathedral of Saint Patrick stained glass windows were created in Syracuse, New York by the Henry Keck Studio. Henry Keck was born in Germany in 1873 and became an apprentice in the stained glass workshops of Louis Comfort Tiffany, the celebrated interior designer of Art Nouveau fame who is especially known for his pioneering innovations in glass design. While Keck was learning the craft of glass cutting and glazing from Tiffany, he decided to go further and learn the art of stained glass design. Keck's work had a distinctive Arts and Crafts style, different from traditional stained glass. His drawing was simple and inventive. By thickly leaded outlines, he emphasized stylized but naturalistic figures. His compositions were carefully studied and arranged in mosaic like patterns. Keck chose opalescent glass for its bright and pure colors and unique textures which produced remarkable and dramatic moods in response to changing light. By 1920, Keck had a reputation as one of the best stained glass designers in the business. Even after his death in 1956, the Henry Keck Stained Glass Studios continued to produce superior glass windows until it closed in 1974. The Cathedral experienced a period of major renovation beginning in 1979. The original character of the building, including memorials and windows, were preserved, while the church was modernized. Inside the Cathedral, new designs were added to the ceiling. Over the nave, a blue and silver ceiling depicts crowns with a cross, along with wheat and grapes, symbols for the Eucharist. The design comes from the Diocesan Coat of Arms, and serves as a reminder of Queen Charlotte of Mecklenburg, whom the city of Charlotte was named after. The cross and crown was used by Queen Charlotte as her heraldic symbol. A new altar was constructed from the marble of the original High Altar, and the original Moller pipe organ was replaced with a new organ designed and manufactured by W. Zimmer and Sons of Fort Mill. On June 10, 1979, Bishop Michael J. Begley of Charlotte presided over the celebration of the church's reopening. In 1994, the Cathedral underwent another renovation project which was completed by 1996. The project's primary emphasis was to restore the Cathedral to the original 1939 condition. Changes included giving the beautiful Italian marble altar, baptismal font, statues, and ambo a new prominence. Hardwood flooring was installed, and the oak wainscoting from the 1979 renovation was removed. A permanent copper roof and Stations of the Cross were installed, and a new Celtic cross enhanced the parish grounds. On March 28, 2007, a 700-pound bell was raised in the bell tower. The bell, a gift from Herb and Louise Bowers and family, was originally cast in 1875 in St. Louis, Missouri. On June 3, 2006, ground was broken for the construction of a Family Life Center to provide room for the various ministries of the Cathedral, as well as banquets and celebrations. The new building was dedicated in January 2008 to former rector, Father Paul Gary, who started the project. In January of 2012, a $25,000 renovation project commenced to relocate the tabernacle, the bishop's cathedra (chair) and the ambo. In renovations in 1979 and later in 1996, the tabernacle was moved to outside the sanctuary, the marble flooring from the sanctuary was removed to make the benches and the marble communion rail was removed to form a decorative relief on the center of the sanctuary wall. The 2012 renovations moved the tabernacle back to the center axes of the sanctuary and the bishop's chair was moved to the left. The marble ambo, which had sat to the left of the altar, was moved to the right. The marble benches were removed, and the carved marble decoration along the center of the back sanctuary wall were taken down and reused to fashion an altar of repose for the tabernacle. The cover of the marble baptismal font was also restored. On the heels of the interior renovations, the Cathedral began renovations on the front entrance of the church. The new, larger entrance, dedicated on October 13, 2013, features two staircases running down to the left and to the right from the doorway, including several landings so that the steps slope more gently down to the sidewalk and street below. Details in the entrance's new design showcase symbols of our Catholic faith, from the Chi-Rho symbol for Jesus to roses and five-pointed stars. A new railing features a Celtic cross in honor of St. Patrick, with a repeated fish pattern symbolizing the 40 days of Lent and a woven Celtic-knot inspired pattern with circles representing the Eucharist. At the sidewalk level, a meditation bench was installed along with a compass design inlaid in the sidewalk to show the cathedral's traditional east-west orientation. In 2014, The Cathedral of Saint Patrick celebrated the seventy-fifth anniversary of the dedication of the church. To commemorate the anniversary, Bishop Peter Jugis declared that from the seventeenth day of March in the year of Our Lord 2014 (Saint Patrick's Day) until the seventeenth day of March in the year of Our Lord 2015 (Saint Patrick's Day) the time would be a “Year of Celebration” for the clergy and faithful of the Diocese of Charlotte, and he exhorted all of the faithful to make a devout pilgrimage to the Cathedral. In May of 2014, a newly constructed outdoor Marian prayer grotto was dedicated to the memory of babies lost through abortion and miscarriage and for the consolation of their parents. The grotto features a beautiful statue of the Blessed Virgin Mary placed within a stone grotto, nestled in a wooded area close to the parish’s family life center. With benches and a gravel walkway, the area is a peaceful area for prayer and reflection. On September 1, 2014, the unmistakable sounds of Irish bagpipes greeted hundreds of faithful as they entered St. Patrick Cathedral to commemorate the parish’s 75th anniversary. The Mass celebrated the dedication of the Cathedral, which took place in 1939. "For 75 years St. Patrick has had his hands raised in blessing since the day this place was transformed from a building into the house of God through the prayers of dedication and consecration," Bishop Peter Jugis said during his homily. "The Lord indeed did have a very special blessing and honor prepared for this church, by elevating it to the dignity of a Cathedral and placing it as the 'mother church' of the diocese, first in rank among all the churches of the diocese," he said, "All of the churches, as it were, are contained in this one – a symbol of the unity of the diocese." 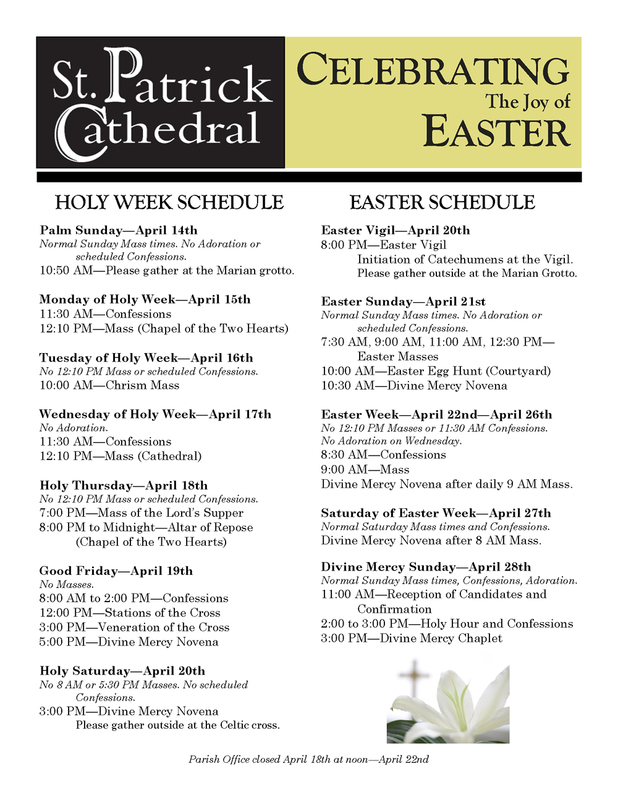 Today, the Cathedral of Saint Patrick is home to more than 700 families. Our parish is a beacon of hope and faith in the Charlotte community. Our parishioners form a community that endeavors to support one another as we grow together in faith and holiness. Moreover, the strength of our faith, and our commitment to authentic Catholic values, teaching, and tradition, will ensure that the parish will continue to reflect God's endless love, grace, mercy, and goodness for years to come. The growth of the Roman Catholic Church in Charlotte can be traced to the early nineteenth century. A permanent Catholic presence started in 1851 with about 100 Catholics. Today, the total population of the Charlotte area is approximately 4.1 million people with approximately 124,000 Catholics. Read More. I arise today through a mighty strength, the invocation of the Trinity.Through a belief in the Threeness, through confession of the Oneness Of the Creator of creation. I arise today through the strength of Christ's birth and His baptism. Through the strength of His crucifixion and His burial. Through the strength of His resurrection and His ascension. Through the strength of His descent for the judgment of doom. I arise today through God's strength to pilot me; God's might to uphold me, God's wisdom to guide me, God's eye to look before me, God's ear to hear me, God's word to speak for me, God's hand to guard me, God's way to lie before me, God's shield to protect me, God's hosts to save me. From snares of the devil. From temptations of vices. From every one who desires me ill. I arise today through a mighty strength, the invocation of the Trinity. Through a belief in the Threeness. Through a confession of the Oneness of the Creator of creation. I arise today through a mighty strength, the invocation of the Trinity. Through a belief in the Threeness. Through a confession of the Oneness Of the Creator of creation.